By fish fillets, of course, I’m speaking of whatever type of fresh fish you prefer – swordfish, salmon, catfish, or whatever else you like. In our case, we used fresh catfish fillets. These fillets had never been frozen and were actually caught in a river just a day or two before we prepared them. They smelled, looked, and tasted delicious. Obviously, you’ll need several small fillets of whatever type of fish you prefer. For this recipe, we’re using an amount that adds up to about two pounds of fish. We’re also using a bit of olive oil to brush the fish with before grilling. 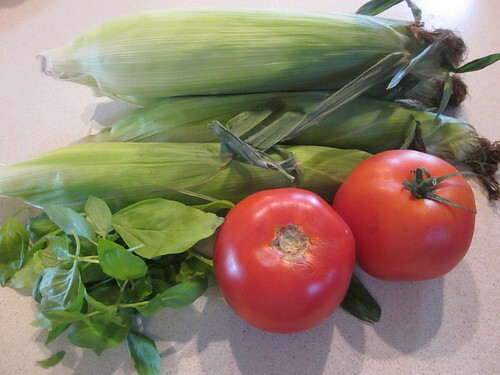 For the corn and tomato relish, you’ll need four ears of corn and two large whole tomatoes, as well as a bit of basil (fresh or dried, whatever’s easier for you). These are easy to acquire in the mid-to-late summer. You’ll also need a grill, of course. In our grilling process, we used two small cedar planks to grill the fillets on. These are not required – the planks were gifted to us by a friend. If you do have an opportunity to use them, they do add a certain character to the fish, but I’m not convinced I would invest any of my own money into the planks. One step you can take in advance is to prepare the vegetables. Roughly chop the tomatoes and store them in a bowl. 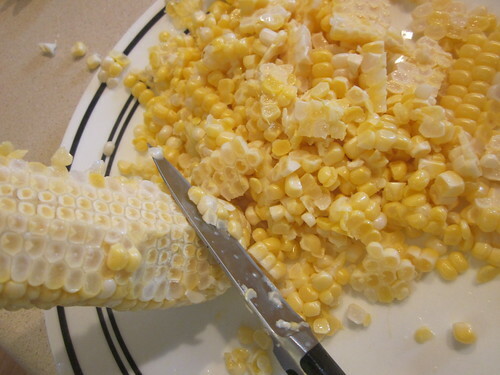 You’ll also want to shuck the corn, then use a knife to slice the kernels from the ear. It’s pretty easy to do – just start at one end of the ear and guide the knife below the kernels. If you cut too deep, you’ll feel a lot of resistance, so just let the knife guide you. Preparing the relish is quite easy. Simply put two tablespoons of olive oil into the pan, spread it around, and heat it over medium-high heat for a couple minutes. 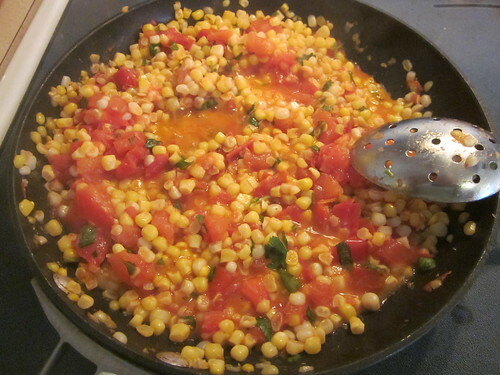 Add the corn and stir it regularly, waiting for the kernels to brown just a bit. Then, add the tomatoes and either two tablespoons dried basil or 1/2 cup minced fresh basil. Keep stirring and cooking for about another minute, then turn off the heat. Your relish is done. The fish is even easier. Start your grill, lower the rack until it’s close to the flame, and turn up the heat to high. Brush the fish with some olive oil and sprinkle a bit of salt and pepper, then put the fillets right on the grill. 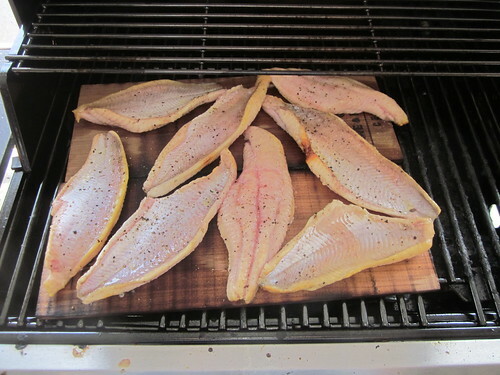 Grill the fillets for four minutes, then flip them (unless you’re using the wood planks, in which case you don’t flip). Allow it to grill for four minutes more, then use a thin knife to check the center of one of the fillets. Depending on the type of fish, you’re probably looking for a white flaky texture to indicate doneness. If you’re unsure, check the temperature, as fish need to have an internal temperature of 140 F to be done. 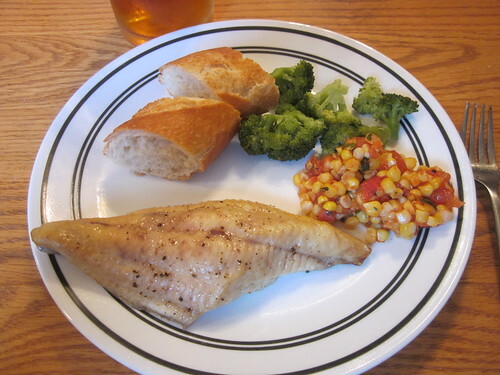 Take the fish off and serve with the relish and perhaps some vegetables on the side. If you wish, you can marinate the fish as you desire. Lemon juice, lime juice, orange juice, and many herbs and spices are common things to add to grilled fish. When accompanied by the relish, I like the fish to be nice and simple, but experiment! Do things that seem tasty to you!